In recent years, pathological findings in small nerve fiber tests have been described in various neurodegenerative disorders, where they were either unexpected or where they potentially explained symptoms that were so far of uncertain origin. 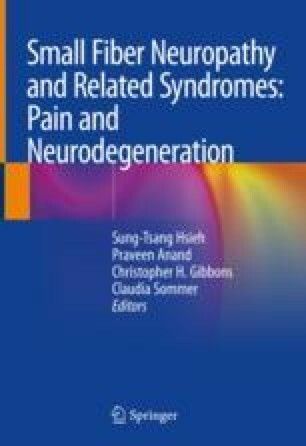 In amyotrophic lateral sclerosis (ALS), traditionally considered a pure motor neuron disease, mild sensory symptoms may occur late in the disease. Accordingly, ALS patients have a decrease in epidermal and dermal nerve fiber density of the distal calf skin, as well as morphological changes (focal swellings), regarded as predegenerative changes. These findings support the notion of a distal axonopathy in sensory neurons in ALS. The understanding of Parkinson’s disease has recently changed from a basal ganglia disease to a multisystem disorder. Part of the spectrum of symptoms in PD is sensory disturbance and pain. Patients with Parkinson’s disease have pathological tactile and thermal thresholds in quantitative sensory testing and a significant loss of intraepidermal and autonomic nerve fibers and the touch-sensitive Meissner corpuscles. Furthermore, the pathological hallmark of Parkinson’s disease, deposits of phosphorylated alpha-synuclein, can be detected in dermal fibers. Data on other neurodegenerative disorders and skin innervation are accumulating. Monitoring small fiber function and morphology in these disorders may prove useful as a surrogate marker in clinical trials.